Its blogger Nathan W. Murphy started it. But The Legal Genealogist can’t resist picking up the challenge and sending it on. As you can see, I don’t have nearly as much information as Nathan has, in part because of problems getting German records. Looks like the leftmost person died of living. It gets us all eventually. Happy Halloween! She’s certainly working on it, Ruy — some days faster than others. Happy Halloween to you too! I could easily spend the next few hours at work with this! Great chart, and this will no doubt be yet another task for the weekend! When your sons complain that Daddy isn’t paying attention to them this week, tell them to blame Nathan Murphy, not me! Oh, just wait until you have to do this for a real doctor… I wish I’d taken my computer with me. I’ll take a print out with me every time! Well done, Dave! But that “broken heart” story deserves to be told! Grandma (one of the daughters in the FGS luncheon story) was hospitalized; Grandpa was put into an institution because of his mental illness. Begged to be let out, so a daughter brought him home; said daughter’s husband was a state trooper, who carried a .357 Magnum as his service revolver. Grandpa decided he wasn’t going back…. The family kept it a secret from their mother, except when the out-of-town family came for the funeral, Grandma’s busybody brother, knowingly in violation of the children’s wishes, told her what had happened. She made a rapid decline and died quietly. My own grandmother, her eldest daughter, always said she died of a broken heart. A very sad, but very sweet, story, Dave. This is a great, quick way to do this! Not to mention fun (and timely)! Interesting variety you have, Judy. Mine would just be heart attack, arteriosclerosis, heart failure….. Thanks for that Judy. I have some personal lists that I make on family members that are quite fun. Who was a smoker? Were they a tea or coffee drinker? What party affiliation? Who were alcoholics? I found on my paternal side a relative from the middle 1800’s who drank too much, and he was a primitive Baptist preacher! Source for that was newspaper articles. Fun, fun, fun. That’s interesting, Afina! I’ve seen some old German civil registration records that do give the cause of death. When my Dad was diagnosed with pancreatic cancer, we joined a very well respected pancreatic cancer familial tumor registry. Part of joining included my coming up with a list of who died with what on Dad’s side. As I collected death certificates, and listed to everyone saying how disgusting that was, the attitudes changed to wow, I had no idea. We all thought it was purely heart attacks and strokes that folks in the family died from and while there were plenty of those, there were alot of other conditions that killed family members. I am currently working on Mom’s side. I also keep track of everyone’s current conditions, from high blood pressure to auto-immune diseases. It’s quite the collection. However, while it is really good to know the family medical history, there are the occasional hypochondriacs that one needs to be careful sharing this kind of info with. This is a fun Halloween exercise — but as you note with very serious personal health implications. “Wow, I had no idea” is a common response when people see a pattern of death issues… and it’s one that can lead at least some to make good decisions about their own behavior. When we saw how much cancer is on my Dad’s side, it gave us all pause. Then doing some research (I have access to a vast medical library at work), it turns out that some of these types of cancers can be associated by genes. Now no one has an excuse not to have a colonoscopy or ignore certain symptoms. It was very educational and I’m so glad I did this. Nicely done in educating your whole family, Mary! Lisa – that’s exactly what happened to my great-grandfather in 1883! She was so ill she couldn’t get out of bed, and one night she disappeared. The following morning she was found a half mile away, next to the railroad tracks, with a skull fracture. No blood on the engine, and her stocking feet (no shoes) were clean. CSI, invent a time machine! YIKES! Yeah, I’d sure like to know what happened there! When I was told I had heart disease the first thing I did was go through files and view the death records. I wanted to know who and what went on before me…. Just a few off the top of my head: Great grandfather James Hay died of Shock of Paralysis, I’m guessing a stroke. One of his sons died from an old injury because of lack of medical attention at age 24. one ancestor died of softening of the brain. Many died of old age and many children of childhood diseases like whooping cough,and measles. Great Uncle Woodrow Antonio Bosch from Influenza during pandemic of 1918 at age one year and nine months. Finally one I wish I had more info on Thomas Arbuckle drowned in a moat in 1898. Lots of children lost in my extended family to whooping cough, and lots of folks not in my direct line to the 1918 flu. I like this format. I had done a similar thing but summarised in pie graphs. I have a very high chance of dying from lung or heart problems. So your history tells you a bit about what you might need to do to beat those odds! One spooky coincidence I failed to add about the death of my greatx2 grandfather, James Hay. He died on Friday the 13th and I was born on Fri the 13th … that’s not the strangest part to me… at age 12, part of being Confirmed in the Catholic church is to choose the name of Saint … yes I chose James. While I thought the cause of death tree to be a novel way of doing this, I’ve kept up with who died from what in all my lines. Surprisingly, cancer seems to have hit my family across the board in many varieties. All families. All types of cancer. My conclusion—cancer is random and will continue to be until they can pin down the genetic predisposition and develop a preventative cure. My only caveat to your comment would be making it plural: the genetic predispositions and the preventative cures. I saw Nathan’s post on the FamilySearch blog earlier this week. What an interesting concept! And it can actually be quite helpful in a medical sense, can’t it? 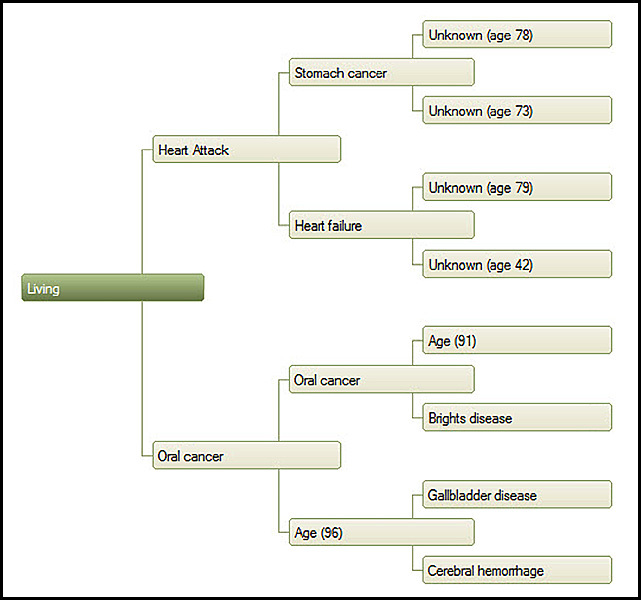 I’ve created my “Death Causes Pedigree Chart” but haven’t posted it on my blog yet. If you’ll forgive the pun, knowing the causes of death in your family is a deadly serious part of family health history — and one reason why many genealogists become genetic genealogists. And thanks as always for including The Legal Genealogist in your finds. It’s always an honor.